With the start of summer, ice cream treats are a staple and gelato is becoming more popular. Do you know the difference between ice cream and gelato? Does gelato contain less dairy or have fewer calories than ice cream? Here’s the scoop! Ice cream and gelato may look similar but are made quite differently and also have unique textures and different nutritional qualities. How they’re made: Ice cream’s first ingredient is cream, followed by added sugar. Ice cream is churned fast, whipping in a lot of air. This is makes ice cream fluffy and light. Gelato on the other hand is made primarily with milk and added sugar. Gelato is churned very slowly, limiting the amount of air that’s mixed in. This gives gelato a thick and dense texture. Nutritional qualities: Gelato is denser than ice cream so a scoop of gelato weighs a bit more than the same size scoop of ice cream. (See chart below.) Calories in gelato are similar to those in ice cream and depend on the type of ingredients used. If you are concerned about fat content, gelato usually has less fat than regular ice cream because it is made with milk rather than cream. Lactose is a naturally occurring sugar and the major carbohydrate in milk. Both ice cream and gelato contain lactose at about 3-6 grams/125 ml serving. Overall, gelato has more added sugar than ice cream resulting in higher carbohydrate content compared to ice cream. Dietitian’s Tip: Both ice cream and gelato are high calorie treats so stick to a small portion (1/2 cup or 125 mL) per serving. 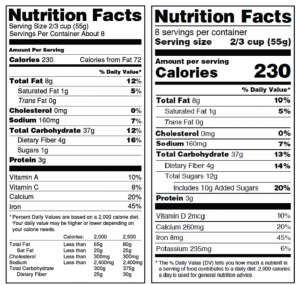 Where possible, check the ingredient list and nutrition label to help you make informed decisions. Saturated Fats and Processed Meats – Fact, Fiction or Controversy? Nutrition headlines never cease to draw interest and boost readership. After all, we are all food consumers and want to know what’s hot and what’s not. Read on for our commentary of the Heart and Stroke Foundation’s new advice for healthy eating and saturated fat, and the World Health Organization’s hot off the press research release on processed meat. A recent study published in the British Medical Journal questions the effect of saturated fat on heart disease. The study also showed that there is a clear relationship between trans fats and heart health problems. Although more work needs to be done, what we see is that saturated fats (which are found naturally in red meat, dairy products and certain vegetable oils) may not be as bad for heart health as we thought. However, trans fats, which are often found in processed or fried foods should be limited in the diet. Another statement recently released by the World Health Organization (WHO) points to processed and red meat consumption as a risk factor for cancer. The WHO media release states: “The experts concluded that each 50 gram portion of processed meat eaten daily increases the risk of colorectal cancer by 18%”. While these numbers sound dramatic, food and nutrition experts caution that they need to be taken in context. Vary your daily protein choices. Include lean meats, poultry and fish (in smaller amounts) along with plant based meat alternatives such as beans, legumes, nuts and seeds. Dietitians of Canada recommends limiting processed meat consumption, in part due to the association with cancer risk as well as the high levels of sodium in these meats.